They'll be so much more excited about having cod tonight when you tell them you're serving it wrapped in bacon. Preheat oven to 350°F. Season fish with pepper. 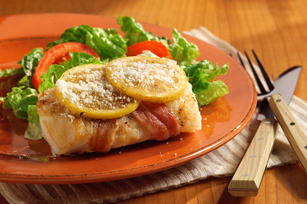 Wrap bacon around fish in crisscross pattern, forming "x" across top. Secure with toothpick, if necessary. Heat skillet; add fish. Cook 3 min. on each side or until bacon is crisp. Remove from skillet, reserving drippings. Place in baking dish. Bake 15 min. or until fish flakes easily with fork. Saute lemon slices in remaining bacon drippings 4 min. or until peel is lightly browned. Remove toothpicks from fish; top with lemon slices. Sprinkle with cheese. If you can't find cod fillets, try tilapia. Fold ends in towards middle to make a square before wrapping bacon around fish. Continue as directed. Fish is best cooked quickly on high heat. For every inch of thickness, bake, panfry or saute fish 10 min. or 5 min. on each side. Fish steaks are a crosswise section of the fish with a piece of the backbone attached. Fillets are lengthwise sections that are often cut and lifted off the backbone.